The sorting and packaging of small, medium and large ceramic formats represent a crucial phase in the manufacturing process. The sorting and packaging of small, medium and large ceramic formats represent a crucial phase in the manufacturing process. System has developed Multigecko Special, a fully automated system with high-end technologies designed starting from a mechatronic approach. The hardware is merged with the software to give life to an interconnected process, where technology guarantees flexibility and speed for small and medium formats. Design and production of Multigecko Special was managed and completed by the End-of-LineResearch and Development department, together with the Electronics Department, by virtue of a methodological approach based on mechatronics. The combination of high profile mechanical and electronic skills enables optimised management of the automation, exploiting the technology to the full. The international market requires increasing flexibility and systems able to dialogue between one another for improved efficiency and productive optimisation. System adopts a multidisciplinary approach in which the hardware merges with the software, and the role of the latter is destined to play an increasingly crucial role given that developments in software will enable systems to meet the demands of a constantly changing manufacturing world. The packaging and wrapping processes are applicable to a host of industrial sectors, enhanced with additional functions besides that of containment, becoming essential means also for purposes of communication. Multigecko Special find its place in this scenario, boasting high performance automation solutions that guarantee higher product quality, optimal levels of flexibility and impressive speed. The tiles are transported on the belt conveyor on infeed to the sorting bench, where the quality is graded by means of powerful vision, measurement and quality systems specially developed by System (Qualitron, Liner 2000, Red Line). The data obtained are processed by Multigecko Special, which selects the optimal box composition accordingly. In this way the material enters the machine along the infeed conveyor and is collected by the pick-up device to form uniform stacks. Once stacks are complete, the gripper picks them up and positions them in the packaging area. One of the special features consists in the 4-axis gripper that is driven by a brushless motor, while 90° rotation is completed by a pneumatic drive. The great advantage of Multigecko Special lies in the double suction cup which enables the pick-up of two parts at a time, depositing them onto an independent stacker that processes two stacks simultaneously. Double axes and double suction cups resulting in a high speed process for special parts. 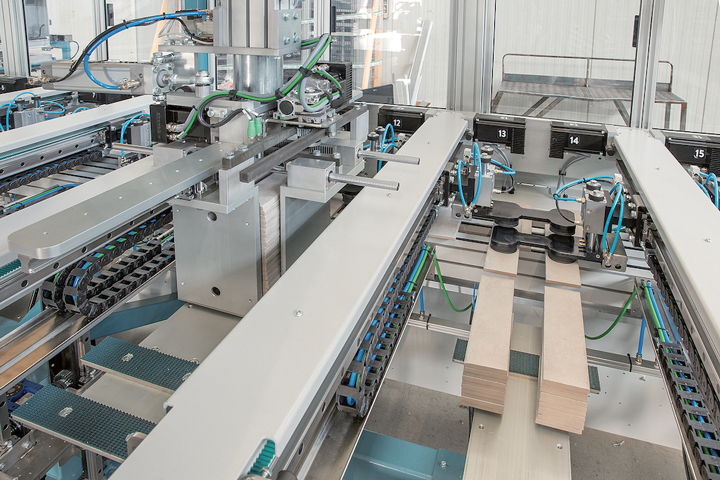 The sorter manages two stacks at a time, and a 4-jaw gripper picks up the stacks to ensure delivery intact to the packaging line, without losing any parts, regardless of size. Movement is on two axes to manage "back and forth journeys". The pack can be created from pre-formed blanks or from neutral carton customisable on the machine. As regards the motors, Multigecko Special is equipped with stepper motors with drives developed by System Electronics. In particular, the technical staff in the department of electronic engineering of System had the task of designing the robotic movement of the machine. The hardware and software have been designed to best respond to the application requirements, such as in the drives, that can operate at high voltages and deliver high currents. Another distinguishing factor is the highly evolved diagnostics system. The added value in this unit is the possibility of using operating voltages and currents according to the needs for machine movement. What's more the power elements of the drives are equipped with temperature sensors to ensure constant monitoring of work conditions. The data are read by special software that emits specific warnings when certain thresholds are reached. This operation has a dual purpose: on the one hand it enables the user to check that the machine is appropriately sized, and on the other the user can intervene and run diagnostics as required. Management of current is digital, thus enabling the elimination of unpleasant noise levels that traditionally accompany conventional analogue controls. High integration: the presence of 4 axes per module, when normally only 1 or 2 are used. Stepper motors can achieve high performance levels, comparable in some cases to brushless motors. Simply consider that with the System Electronics quad, the motors can run at over 2000 rpm with torque exceeding 13Nm, thanks to integrated management of the entire system. Reduction of noise generated by the motor for perfect resonance management. The quad is multi-interface (EtherCAT, Ethernet and Can), is UL certified and has 16 inputs and 16 additional digital outputs. Operating temperature management can be local via the integrated fan or remote via the panel. 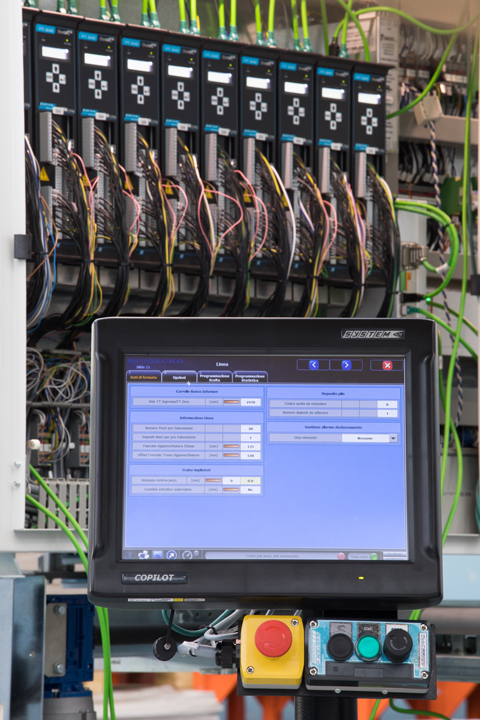 The technology and innovations illustrated in this article are emblematic of how the software and hardware are increasingly blended together to obtain industrial automation processes at the forefront of technology. Multigecko Special represents a major innovative pakaging process with a strong mechatronic approach, which sees an increasing combination of automation technology and ICT. For years now, System has designed and produced systems and processes, in which the dichotomy between hardware and software has now been overcome, leading to the development of high performance motion control solutions able to meet the increasingly rigorous demands of the world market.